at the green gate, you are at Fonte di Papa. You can reach Rome by car, by train or bus. 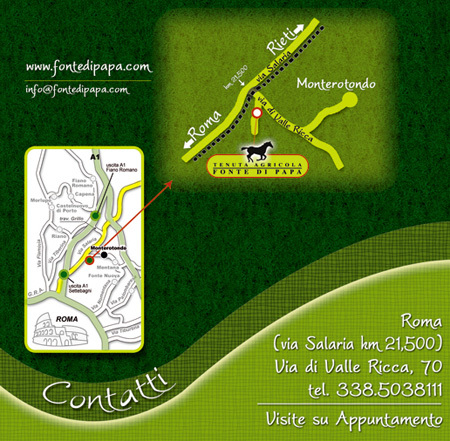 We are at 20 km from St. Peter church, at 9 km from Grande Raccordo Anulare (G.R.A.) and in 30 minutes you will reach Rome centre driving all Via Salaria (20 km). get off at Roma Tiburtina station, where you can find local Metro lines (see map on the site). In 30 minutes you will arrive at Roma Tiburtina station, where you can find local Metro lines (see map on the site).